I've got an awful headache today. People tell me to take a painkiller for headaches - but of course, I already take Panadol Osteo (high strength paracetamol) three times daily. I take other pills regularly that are also pain killers. 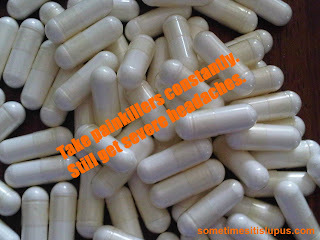 I shouldn't get headaches. But, I do. I still have to have my appointment with the neurologist about my brain fog, and it's possible that there is some actual issue inside my head. But I also have a problem with fluid retention, and I find that taking lasix (a diuretic) will help ease a headache, when pain killers won't. I'm sorry to hear about your headaches. I have them so much of the time, too. Since I've kept a tracker of my lupus symptoms, I've discovered that I've had a headache 81 out of the last 91 days. I take Excedrin migraine, and have taken Imitrex, but I'm afraid to keep taking that. I hope the neurologist can help you!